Computer Desk Pivot Shelf Wood Bookcase High Bar Side Table Storage Display Home. Hobby Desk: Material: Cellular board, stainless steel Unfolding dimension: 187.5W x 50D x 76.1H (cm) Corner dimension: 114W x 120D x 76.1H (cm) Table surface size: 120L x 50W x 76.1H (cm) Side shelf dimension: 110L x 33W x 64H (cm) Colour:Black / White Cellular board thickness: 4.5cm Loading capacity of each layer: 50kg Net weight: 32.5kg Gross weight: 34.5kg Custom label: 831-012(Black) / 831-012WT(White) Bar Counter: Material: Cellular board, stainless steel Unfolding dimension: 195W x 39.6D x 164.5H (cm) Corner dimension: 15W x 84.8D x 16.45H (cm) Colour: White / Black Cellular board thickness: 4.5cm Loading capacity of each layer: 50kg Net weight: 37kg Gross weight: 41kg Custom label: 831-011(White) / 831-011BK(Black). 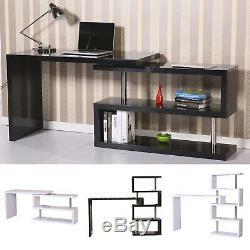 This fantanstic desk is made of cellular board and stainless steel, it is hard-wearing and durable. Through elegant design and high quality craftsmanship, stunning addition is made to your home or office. There is enough layer storage space for placing books, magazines etc. Computer and lamp could be put on top surface for work, study and entertainment. It is shape adjustable and easy to assemble in your room. Elegant design and high quality craftsmanship Sturdy , durable cellular board and stainless steel construction Stable and sturdy construction A wonderful addition to any family room, living room, bedroom and office Multifunctional use Books, magazines, notebook etc could be put on it for work and study Shape adjustable through pivot High gloss PVC blister processing on surface Horizontal 1-360 degree placement through turnplate Stain resistant, easy cleaning and assembly. MH STAR verifiably manages retail globally with branches in US, Canada, Germany, Spain, Italy and France, we now welcome you to benefit from our prices in the UK. In the event that you require any assistance, kindly don't hesitate to get in touch with one of our accomplished and friendly advisors who will be glad to help, our customer service aim answer to your enquiries within 24 hours. We are unable to change this address for your own safety once the order has been placed. If you change your mind and wish to return the unused items to us, it must be done so within 30 days of the item being delivered. However, if you have any issues in regard to your order, we have a dedicated UK based customer service centre who will be delighted to help and resolve any issues that may arise. My item has reached me damaged/faulty/missing parts, what should I do now? To ensure quick resolution, please attach/include photos and part numbers and ask you to provide this information on first contact. This can be done using the "attach photos" tab located underneath the message box. We aim to respond to all emails within 24 hours and will do all we can to resolve any issues as efficiently as possible. I have changed my mind; can I cancel my order? Please note: If the goods are accepted/signed for, we will not be liable for the return costs. Can I collect my order? We do not offer customer collection as we operate from multiple storage facilities across nation that do not allow public access. You can also benefit from free collection at your nearest Argos by ensuring to choose this option at checkout. When will I receive my order? Are you able to deliver outside of the UK? I have ordered more than one item, will they be delivered together? The products might be originating from various stockrooms or conveyed with various dispatches relegations. How do I track my Item? The item "Computer Desk Pivot Shelf Wood Bookcase High Bar Side Table Storage Display Home" is in sale since Wednesday, February 11, 2015. This item is in the category "Home, Furniture & DIY\Home Decor\Other Home Decor".